Within 7 to 21 days of the event, a re-booking fee of 25% of the price of the equivalent tasting will be charged. No refunds will be provided. Within 6 days, excluding the day of the event itself, a re-booking fee of 50% of the price of the equivalent tasting will be charged. No refunds will be provided. In the case of a no-show or a cancellation on the day of the event, no refunds or transfers to another date can be arranged. If you cannot attend and wish to transfer your place to another person please contact us within 24 hours of the event with the name of the person attending. All open-dated vouchers are valid for 24 months from the date of issue. 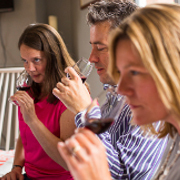 You must book your tasting session before the voucher expiry date. Please note, voucher expiry dates cannot be extended. The above T&Cs do not apply to our weekend wine tasting breaks. Please can you call us if you need to re-arrange to discuss options for transferring to a new date. No refunds will be provided. We reserve the right to cancel or re-schedule an event due to unforeseen circumstances and will offer a refund if no alternative event is acceptable to you. All personal details are kept strictly confidential and are not shared with any other third parties. All payments are processed via an encrypted, secure system powered by WorldPay. As an additional security precaution, we do not store any credit card details on our website. If you currently receive mailings from us and no longer wish to, you can opt out by amending your profile when you sign in to your account or by emailing us via the website. You can view the information we hold about you, update the information and view previous orders by logging into your account. If you need to contact us regarding any aspect of your purchase or for any other reason please call us on 020 8288 0314 or email us.